I would not consider our new enemy a villain in the same category as headwinds, mosquitoes, deer flies, leeches, water snakes, snakes, snapping turtles, alligators or Asian jumping carp (about which, more anon), but it does have the capacity to derail us, to whit, this morning. CG praying to JP or his cushion? 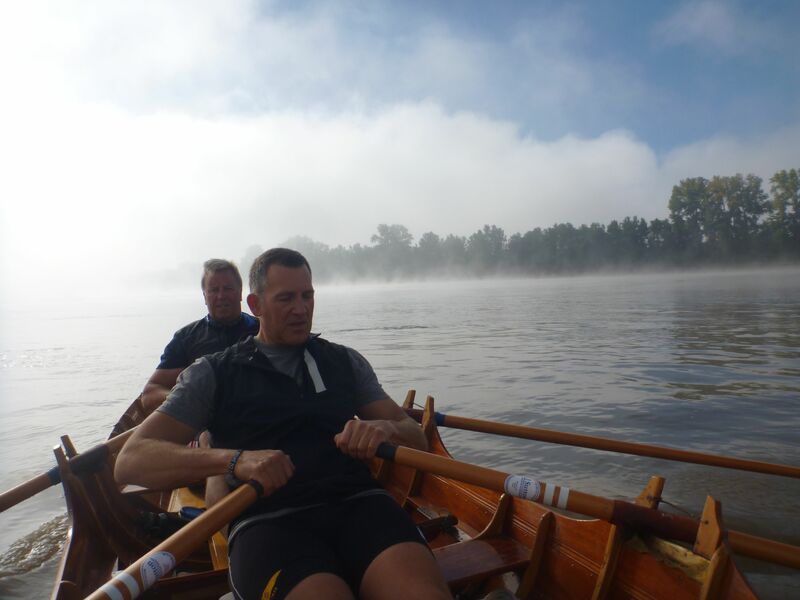 Today was a long day, and one of our key supporters, Chris Gate, has jetted in to row for two days, whilst fitting in two meetings tomorrow in Kansas City and St Louis. Quite how he will manage this is a mystery to us, but he seems sanguine about the arrangements. 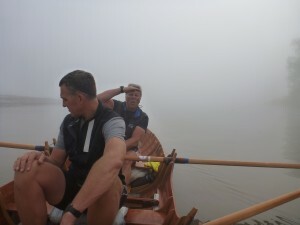 So we set off early this morning for our launch spot, loaded the boat with supplies, got Paddy’s comfy coxing seat sorted and also Chris’s, ahem, padding (Note: whilst others have had issues assuaged to some degree by sheepskin, CG has suffered some absolute humdingers of blisters on his Gluteus Maximus, if you get my drift…). Duly sorted, we set out only to find a layer of thick, impenetrable fog. Now imagine if you will, the kind of obstacles and scale of river I have been attempting to relate, then imagine trying to negotiate this effectively blindfolded. Not an appealing prospect. We waited, then waited some more. The fact is that in most weather conditions you can essentially take the choice to brave them – wind, snow, rain etc – but fog? No thanks very much. So we waited some more and eventually set off 1.5 hours late to row 43 miles. It seems pretty clear that whilst we are headed inexorably south (other than the odd detour of the river to head east, north and occasionally west) and consequently into warm and humid weather, the Fall season is creeping up. This will mean more fog I suspect and we can do nothing but wait it out….. This waiting would, normally, be something of a stay of execution, delaying the pain of mile after mile on the river. However, Graeme and Paddy have been pouring over the maps and have made some recalculations. Now, let me say here and now, they are not saying the river is longer than anticipated. What they have found out is that the maths (or math, take your pick) in calculating river distances is wrong. 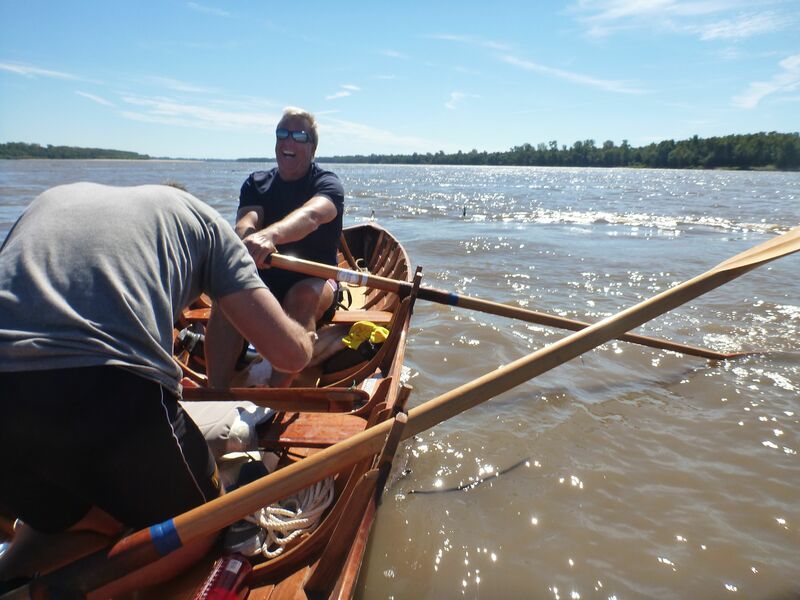 The overall number remains the same at 2,320 miles, but they have realised that if you add the distances between stages, per earlier calculations, the river would only be 1,886 miles long. This, most unfortunately for me and Paddy in particular, but also for the participants, means that some days will be rather longer…. Today was due to be around 28 miles and became 43. Tomorrow and the next day with CG, both remain the same as schedule, but the day before our next rest day will be 51 miles for me and Paddy. We believe we may have one day at 60! So if you are a participant, you may want to check your distances again with the team here. As for me and Paddy, we are looking at the daily sheets with some trepidation as 25-30 felt long enough. Add in some fog to delay starts and our old friend the headwind, and we may need more than Sam Adams and chicken wings to sustain us! But fear not. We are in great spirits and looking forward to several real characters joining us on the ride down to Memphis. I will try to do them, and their achievements, some justice in the blog. Post Script – Asian Jumping Carp (http://www.youtube.com/watch?v=tLmJjRqXDCo). As some of you know, I first thought that this was some kind of joke. That is until I saw the various you tube clips of these huge and ridiculous fish in the Mississippi. Well, we no longer need the clips because we have seen them, first from afar, jumping away in the distance so that you are not sure if you really did see them. Then we saw them up close, so there was no doubt. 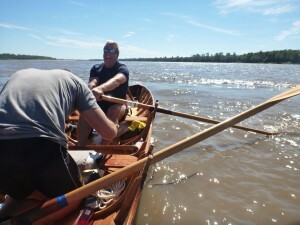 Then they started jumping between the oars and just missing the cox. Then they started hitting the boats. It was only the “flare” in the construction that kept the bloody things out. They are a complete menace to all on and in the river. Whilst they do not eat the other fish, they eat everything else, including the food for the other river dwellers. They are choking the river and it is an enormous problem. If a fisherman catches one, it is illegal to put it back alive. Agog at the achievements of the Grand Fromage and embarrassed at the notion of feasting, while he is messin’ about on the river, on dead carp,assorted root vegetables and pigs’ trotters washed down by various vintage vinos, we decided to can the quarterly lunch in readiness for a post Mississippi pre Yuletide celebratory St John extravaganza on Friday 12 December with the awesome oarsman back in the Chair. Quarterly luncheon vouchers to go the MM Fund. Onwards and southwards mighty Pritch-we’re all with you in spirit if not in body!